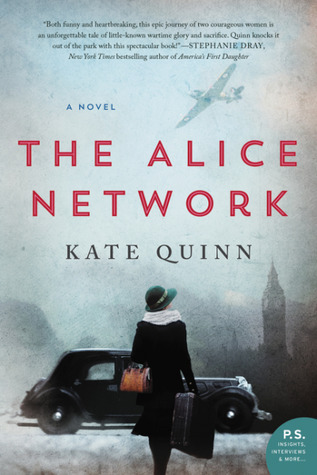 The Alice Network by Kate Quinn, available at HarperCollins, is a stunning and intricate look at the network of female spies during WWI (and later, in WWII) and how integral they were to many of the triumphs and near misses that occurred to bring down the Kaiser (and later, Hitler). Eve is just one of those spies, but the intersection of her story and that of Charlie St. Clair happens just after WWII as a pregnant young woman comes to England in search of the one woman who might know what happened to her cousin Rose. Both women carry extreme guilt for those they were unable to save and both have been broken by those failures. In a world in which men were called to war by posters seeking identical soldiers who would follow orders without question, Eve’s call to arms came in an unexpected way as she typed letters in other languages in an office. Her unassuming stature and her stutter rendered her nearly invisible and an outcast at once, and this is exactly what Captain Cameron sought in recruits. But she would need more than the ability to be invisible, she would need to transform into another person and be able to lie without being detected, even among those who were proud of their lie detecting abilities. Both Charlie and Eve are women who face the double-standard — groomed to be or expected to want nothing more than to be mothers and wives but having the ability to be much more. Charlie, a walking adding machine, is searching for the cousin she loved like a sister who disappeared during WWII, and she bails on her mother’s hope for a brighter marriage. Eve is reluctant to join the search until a name from her past creeps up and her unfinished business rears its ugly head. Quinn has researched the network of spies well, but what she also has done is delved deep into the hearts of these patriotic women to uncover their desires, their fears, and their uncertainty in the face of the unknown. Eve is real, a woman who should have lived during WWI and gained the respect of military men for her unwavering bravery, and Charlie is more than that wayward boarding school girl acting out. These women have experienced great loss and are forever changed by it. But together they realize that a future can still be had for the both of them, if they can only survive the past. The Alice Network by Kate Quinn is a sure winner and a “best book of 2017.” It’s a book you won’t want to put down but sad to see end because you don’t want to leave these heroines behind. Kate Quinn is a native of Southern California. She attended Boston University, where she earned bachelor’s and master’s degrees in classical voice. A lifelong history buff, she has written four novels in the Empress of Rome Saga and two books set in the Italian Renaissance detailing the early years of the infamous Borgia clan. All have been translated into multiple languages. She and her husband now live in Maryland with two black dogs named Caesar and Calpurnia. Find out more about Kate at her website, and connect with her on Facebook and Twitter. It’s finally spring, now only if the weather would warm up, I could get into the garden. Build a … T-Rex illustrated by Kiki Ljung for review from Quarto Knows. Welcome to your dinosaur dig! Build a T-rex and uncover the inner workings of the world’s most ferocious dinosaur. Learn about their body, their prey, and their extinction. Encourages imaginative play with a step-by-step 3D model to build, and simple facts to learn, ideal for young naturalists. Build a … Butterfly illustrated by Kiki Ljung for review from Quarto Knows. Welcome to the butterfly house! Build a butterfly and uncover the inner workings of the world’s most beautiful insect. Learn about their life cycle, how they find food, where they live, and how far they travel. Encourages imaginative play with a step-by-step 3D model to build, and simple facts to learn, ideal for young naturalists. The Alice Network by Kate Quinn for review in June with TLC Book Tours. Beauty and the Beast: A Coloring Book by Gabrielle-Suzanne Barbot de Villeneuve from Media Masters Publicity.